For almost a month, mom and I walked about lifeless as though diabolical activities in the spirit realm sucked out our strength. We had approached the Lord on this matter. Once again, I was taken deep into Spirit Revelation and saw that our Ministry had lodged in a certain place. Through Spirit Revelation we knew that the first beast had already taken his place, although he had not yet exposed himself. A diabolical pervasiveness permeated the Earth’s atmosphere, for the spirit of the beast hung heavily. Without anyone noticing the beast went about secretly persecuting all Believers and Christians. Then we understood why our Spirit load had become extra heavy. Earth’s entire atmosphere hung darker and thicker; as the days went by, I could touch and squeeze it. All Spirit filled, Redeemed of the Lord, you will understand, your Spirit will know. Anyway, for this reason, we gathered to fill our spirit with the Word. For soon and very soon, all Bibles would be destroyed. I saw that each one had in their possession, booklets which Christ End-Time Ministries had handed out by the thousands. These booklets contain True Encounters with the Holy Lord Jesus. His Bride the world over became Living Testimonies for the Lord’s Glory. It was shown to me that these booklets could not be taken away or destroyed. I also saw that one of the brethren was led to put the television on, when lo and behold, the first beast made its appearance. Now we knew that the beast had hastened, although it was not actually his season to make his appearance. We watched as the beast walked to the microphone disguised as a black American. Suddenly, the beast tripped and fell; he was terribly wounded. I watched as he was covered in blood unable to move. The time had arrived for the second beast to make himself publicly known, although we knew that his time was not yet. He too walked towards the microphone before the media. I do not know what happened but both beasts were terribly wounded. The second week into July, my mother and I listened to a message of Elvi Zapata – “Don’t come out of the Ark, Jesus is Coming.” Once again, I was taken into a Spirit vision in which Brother Michael, my mother and I, together with my little girl, headed home. Along the way, Brother Michael and I turned around to wait for my mother; instantly, we gasped! The entire sky had turned black due to an extremely mighty tornado. I knew that this killer had covered most of the land, but I shuddered at this terrible sight. 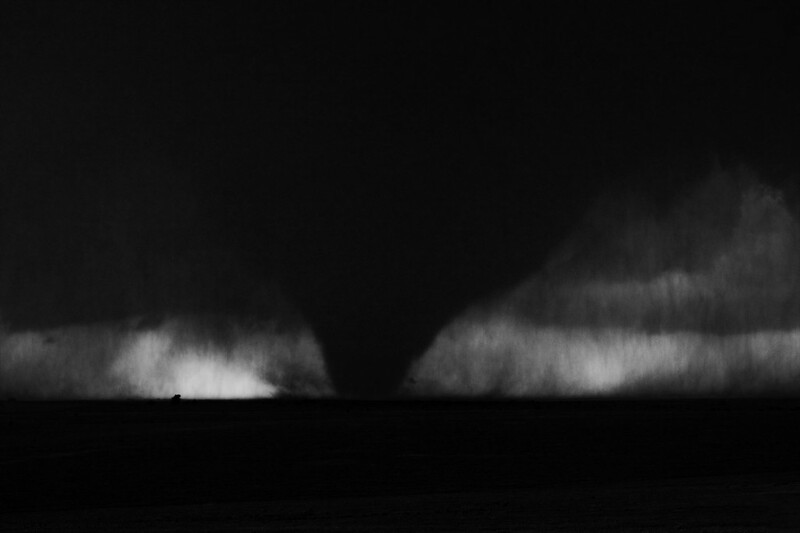 There were three smaller vicious funnel-like tornados within this great tornado which was caused by its fierceness. Accompanying us was another Believer with her three children. When she looked upon this sight too terrible to describe, she said, “I do not want to serve the Lord anymore.” Furthermore, she refused, although I persistently urged her to change her mind. I turned to Brother Michael who told me to let her go. On reaching home, we secured the place, preparing for the tornado to strike.